What’s more American than hot dogs? It’s a simple processed food that most Americans have been eating since they first learned to walk. Hot dogs come in many different varieties and sizes. The hot dog has become a staple of American summer backyard barbecues. Ironically it was German immigrants who introduced America to what would become its favorite food. Oscar Mayer is the most well known of the many different hot dog brands. The company was founded in 1883 by Oscar Mayer (a German immigrant). When the 20th century rolled in, Oscar Mayer hot dogs had become so popular they were permanently a part of American culture. Even a century later Oscar Mayer hot dogs still remain very popular. One of the reasons for the success of the Oscar Mayer brand has been top notch marketing. 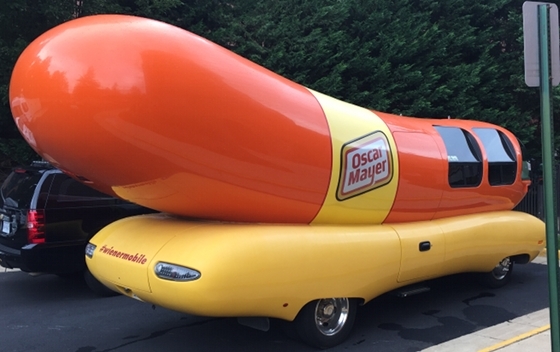 Before the era of the TV and long before the Internet, Oscar Mayer created one of the greatest marketing tools for its products in 1929 – the Wienermobile. It was pure brilliance, a car in the shape of a hot dog on top of a bun. Not only would this strange looking vehicle draw stares but it would permanently implant into many onlookers’ minds the message that Oscar Mayer is synonymous with hot dogs. This type of advertising is what every Madison Avenue executive dreams of creating. It’s impossible to calculate how many hot dogs were sold due to the first Wienermobile, but it’s a fair guess that it was many. The cleaver aspect of the Wienermobile was that it was mobile, allowing it to easily move from city-to-city bringing the Oscar Mayer sales pitch to many potential new consumers. Since the first Wienermobile, there have been many more over the years built on different platforms (including Chevrolet, Dodge, Ford, etc. chassis). Fast forward to 2016, there are eight Wienermobiles currently in service. Two are Mini-Me versions that are based on the Mini Cooper S. The other six are the big Wienermobiles that most of us are familiar with – these are all built on a GMC W-series truck platform. 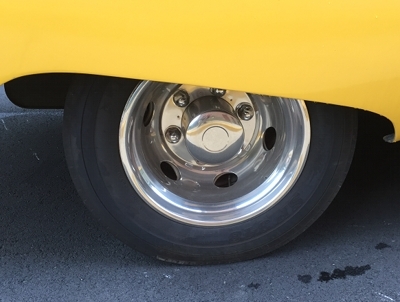 It is the most heavy duty platform ever used by a Wienermobile. Unlike many of the previous Wienermobiles, this modern version provides plenty of acceleration punch. It’s powered by GM’s 6.0 liter LS series V8. Since this 6.0 liter LS V8 is used on a truck platform, it’s a safe guess that it’s either the LQ4 or the LQ9 version. The LQ4 produces 300-325 horsepower and around 370 lb-ft of torque. The LQ9 produces around 345 horsepower and 380 lb-ft of torque. The LQ9 is the newer of the two but it has been around for 15 years. The last major Wienermobile redesign was back in 2004 and both the LQ4 and LQ9 were being produced at that time. The LQ9 would have been the more pricey engine but also more powerful. Even though the Wienermobile does have a hood, somewhere inside the Wienermobile bun (no bun or pun intended) is the answer to this mystery. 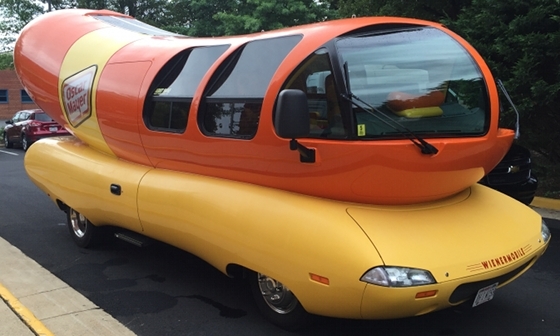 Imagine my surprise when I stumbled across one of these Wienermobiles over 4th of July weekend. Just a few short miles outside of Washington, D.C. There’s no time during the year when hot dogs are consumed in greater numbers than on the 4th of July. 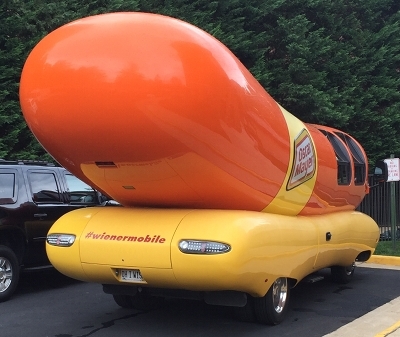 So it came as no surprise that a Wienermobile would make its trek to the Nation’s Capital during this special weekend. 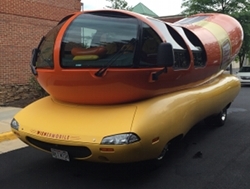 I have attended many automobile press events and seen so many different types of automobiles over the years, but I have never encountered the Wienermobile before this special day. That is why this chance meeting was such a nice surprise. I happened to stumble across it in a hotel parking lot. I wasn’t the only one getting a closer look and taking pictures. A Ferrari Enzo couldn’t have attracted as much attention. For a period of just 30 minutes at least 40 people were interrupted from their normal activity by curiosity and had to get a closer look at the Wienermobile. I have been intrigued by the Wienermobile ever since I read a test drive article of one in Motor Trend magazine as a teen. Surprisingly Motor Trend at the time ran it through all the performance tests like any new car of that era. As you could probably guess it accelerated as slow as a 500-lb fat man jogging and handled like an ocean liner taking an emergency hairpin turn. None of that mattered, the Wienermobile didn’t lose its broad appeal due to its crummy performance numbers. It’s a symbol of the ultimate marketing tool, and only Oscar Meyer had the guts to build something so ridiculously juvenile and to continue to do so many times over. My guess is if Motor Trend were to test the current 6.0 liter V8 powered Wienermobile, the numbers wouldn’t be so bad. I have seen many of these speciality built vehicles, most look good from a distance but from up close the flaws and sloppy bodywork or shoddy fitment of panels is easily apparent. Not here, I was surprised of the excellent fit and finish of the Wienermobile, all the seams and panels seemed to be perfect. A lot of professional body and panel work occurred in the process of its construction. Additionally no cheap materials were used in its construction. It’s obvious there were no shortcuts taken. The Wienermobile is solidly constructed. It’s not easy putting a massive (curved) fuselage on top of truck platform but the builders made it seem easy like riding a bike. Another thing that struck my attention was someone in the design phase had actually shaped the exterior for optimum aerodynamics – at least as optimum as you could expect for a car that looks like a gigantic hot dog on a bun. Even the front headlamps and rear LED tail lights fit the streamlined body perfectly. 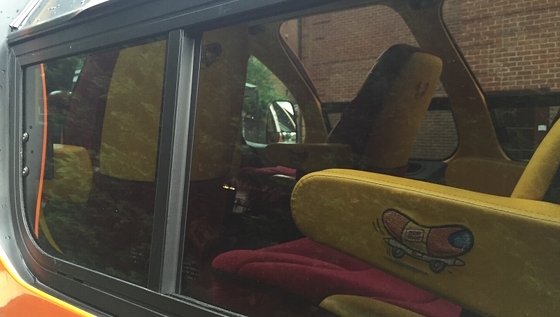 The Wienermobile is setup like a coach bus where there’s only one point of entry into the cabin. There’s one door located on the passenger-side in the mid-section of the vehicle. The interior has a configuration like a lear jet – a center isle that provides easy access to all six seats. There are three rows of bucket seats that fit six comfortably. The bright yellow and red interior looks like something out of the 1970s. There’s even a sunroof to offer a little open air experience. For the first two row of passengers outward visibility is excellent with large curved side windows. For the driver the Wienermobile is no different than navigating a RV – there’s the tall ride height and the large truck-like side mirrors. The Wienermobile didn’t disappoint, finally seeing one so many years after reading the Motor Trend article made it a very special day for me. Sometimes the most unexpected encounters with cars can be the best. The Wienermobile proves this beyond a shadow of doubt.